I had arthroscopic surgery on my right shoulder in June 2008. 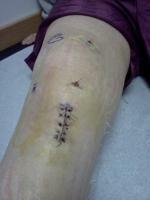 Prior to surgery I had alot of pain and was on pain meds for a long time. I had pain through the bicep and back into my shoulder blade. The MRI only showed tendonitis. The surgeon removed a bone spur and after surgery I did pretty good for a while. Then things started going downhill and I have alot of the same pain back. I had an MRI last week and it is worse than the first one. It shows tendonitis and fluid in the subacromial/subdeltoid bursa which was not seen before. I have very limited shoulder movement and pain all the time. Particular movements cause severe pain. I am going to a shoulder surgeon for a second opinion. He suggested a cortisone shot before he saw the MRI. I am not sure what he will recommend in January but I don't want any more cortisone. I have already had two shots in that shoulder and they did nothing for me. Plus I know that cortisone can be helpful over the short term but can be destructive over the long term. I would like to know what your opinion is about what I should do. I am thinking that I need a second surgery so he can go in a see what is going on with the bursa and remove it if necessary. I am not sure why the first surgeon did not remove it. Is the bursa needed for functionality.? I have read mixed reviews about this. Any help you can give me would be greatly appreciated ! Also, I am a 53 year old woman and had this injury in both shoulders due to repetitive motion.